Bubble tea is a popular drink from Taiwan that migrated to America starting in the 1980s. Essentially, it is a tea base mixed with fruit or milk and slightly cooked tapioca grains (known as bubbles or pearls). However, different interpretations of the drink are common in the West, with all different creations being crafted. Nevertheless, from its tropical origins to the seventh coldest state in the nation, Vermont has adopted bubble tea as its own and never looked back. So come along as we count down the best bubble tea places in the state . Offering more than 100 tea options, Dobra Tea hails all the way from Prague, where they opened their first tea shop in 1992. Their shop in Vermont’s Queen City marks the company’s first U.S. established tea room. Needless to say, the environment, the music, and, of course, the tea whisk you away to exotic lands as you enter the doors. Billing themselves as “a Bohemian tearoom and loose-leaf tea shop” bubble tea is one of their specialties, and you are invited to relax as you indulge in a tea way of life. At M-Saigon, you are going to find pho soup, banh mi, and other traditional Vietnamese dishes, like hand-made pork meatballs that are, by all accounts, sweet, smoky, and tender, but you will also find the exotic delicacy of bubble tea. Find durian smoothies with boba, mung bean tea, and cantaloupe-flavored milk with tapioca. Family owned and operated Taste of Thai offers a fusion of Thai and Laos cuisine. We have mentioned before our love of food truck cuisine because of the fresh ingredients, food that is freshly prepared, and facetime access with the chefs preparing the food. Well, Taste of Thai gets top-notch scores on all of that and more. Plus they have bubble tea that is humble and delicious. 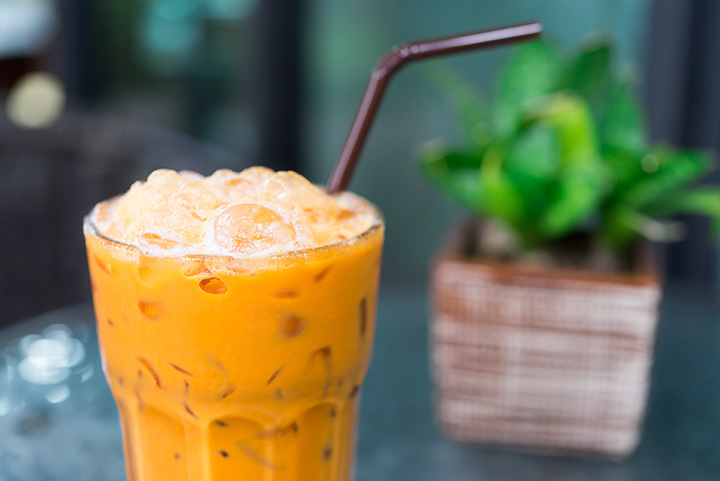 This Asian, Thai, and vegetarian cafe offers traditional noodle dishes, curries, stir-fries, and soups, but they also offer Thai iced coffee and a fresh-brewed green tea with tapioca pearls and sweetened condensed milk that will knock your socks off. By many accounts, this fresh, vinous, sweet concoctions is exotic, refreshing, and addictive, and it complements the fresh menu perfectly. Tusi Tea is a worker-owned tea house offering whole foods, small plates, herbal tinctures, sweet treats, and house-made chai, Tibetan butter, and bubble teas. Sign up for a treat of the week, food packages, or stop in to see what they have on hands. Find organic fruit smoothies, Chaga Chai, and extensive bulk teas. Reports say the owner has taken time away from the business, but, not to worry, you can still find here delicious concoctions on the weekends and online. Viet Thai Offers everything an authentic Thai restaurant should, from fried dumplings to Thai curry. Plus specialty drinks include kombucha, Thai iced tea, Vietnamese iced coffee, and, you guessed it, bubble tea. This Taiwanese classic is served in flavors that include mango, coconut, taro, avocado, and more.